The above quote is from Michael Green’s screenplay for the 2017 film adaptation of Murder on the Orient Express, and it’s a remarkably apropos reflection of the various fan and reviewer reactions to the movie. Adaptations of Christie works have always sparked wide-ranging emotions from viewers, and fans of her work and relative newcomers to the Christieverse often have surprising reactions to these productions. Often there is a certain level of consensus: the David Suchet Agatha Christie’s Poirot television series, for example, comes as close to being universally beloved and critically respected as possible (especially the early years), whereas some of the lesser adaptations of her work are widely panned. The 2017 Murder on the Orient Express is a bit of an anomaly due to the widely divergent opinions of the film. As one movie-theater ticket taker of my acquaintance told me as I was about to see the film for the second time, “People either love it or hate it.” Indeed, looking at the critical reviews of the film, since the movie’s release,Murder on the Orient Express has hovered around a 58- to 59-percent rating on the Rotten Tomatoes website, making the movie just a couple of positive reviews away from a 60-percent “fresh” rating. In terms of box office, the mixed reviews have not sunk the movie’s earnings. By Christmas of 2017, the movie had grossed well over $300,000,000 in under two months of general release. With an initial $55,000,000 budget and many years of DVD/Blu-Ray and streaming sales to come, the 2017 version is a profitable hit, with a sequel, Death on the Nile, on the way. Clearly, a lot of people like the new movie. Yet there are a significant number of dissenting voices, particularly among some of the most prominent movie critics as well as some self-described Christie fans who are quite vocal in their dislike for the film. Many of the criticisms are perfectly valid, while others are a matter of taste, and still others are based on common false assumptions about Christie and outright snobbery. As for myself, I thoroughly enjoyed the movie, yet I can understand why some viewers may have had issues with it, while I feel the need to protest some of the most egregious slurs and invalid attacks on the film. To begin a proper analysis of the 2017 Murder on the Orient Express, it is imperative to address the most commonly asked question about the film (other than “Whodunit?” of course): is this movie necessary? Often this is a loaded question. The 2017 rendition is a remake, as many of the film’s detractors make a point of observing, before making an agonized display of mourning the fact that Hollywood has a serious creativity and originality problem. The point is compounded by the fact that the 1974 adaptation directed by Sidney Lumet is widely considered a classic, and the tonally dark television version starring David Suchet has plenty of admirers (though it too has its share of detractors). The near universally disparaged 2001 telemovie starring Alfred Molina rarely factors into the conversation, nor does the acclaimed 2015 Japanese TV miniseries, which is not as of this writing widely available with English subtitles. I say that this movie is as “necessary” as any other, not least because it is pivotal to understanding fan tastes and reactions as well as better comprehending how a murder mystery can succeed on film. The various criticisms of the movie are best addressed individually. The first and probably most commonly addressed complaint cuts straight to the characterization and depiction of the central character: Poirot’s moustache. This is, without a doubt, the largest and most physically dominating moustache ever to be worn by Poirot. In previous incarnations, his moustache is generally small and delicate, though often waxed into an impressively elegant shape. It’s worth noting that Christie’s primary complaint with the 1974 adaptation of Murder on the Orient Express was that “I wrote that my detective had the finest moustache in England, but he didn’t in the film. I thought that was a pity. Why shouldn’t he have the best moustache?” In contrast, the moustache worn by Kenneth Branagh is positively gargantuan. Branagh chose not to color his hair the traditional jet-black shade favored by Poirot, and the moustache is coupled with a little soul patch tuft of a beard. The new moustache is certainly at odds with what many fans expect, and yet… aside from the color, this may be the moustache that is truest to Christie’s original depiction. On multiple occasions in Christie’s stories, Poirot’s moustache is described as stiff and military. Before Branagh’s moustache was revealed, I had never thought to look up what exactly Belgian military moustaches looked like in the World War One era. I was amazed to discover that Belgian officers were known for wearing extremely large and carefully styled moustaches, which became symbols for strength and virility. Not only that, but in Christie’s mysteries, Poirot’s moustache is described as being enormous, and at one point in the novel of the same title, Poirot has some difficulty keeping his huge moustache from falling into his soup. Indeed, the oversized facial hair appears to be exactly the sort described in the books, though the little beard is less so. I do have some serious problems with minor aspects of the adaptation. For example, one piece of glaringly obvious product placement is a distraction that leaves a sour taste in my mouth (which, ironically, could probably only be dispelled by the sweet flavor of a Godiva chocolate). Another point of frustration for me is the end credits. I completely understand that some of the actors cast in the movie are more famous (and some possibly have better agents) than others. But one of the major problems with the end credits (and indeed, the movie posters and other advertisements) is that there seem to be “first class” and “second class” tiers for the actors: most of the performers get their own individual name credit at the end of the movie and are listed on the posters as well, but Lucy Boynton, Olivia Colman, Manuel Garcia-Rulfo, Marwan Kenzari, and Sergei Polunin have mostly been left off the posters and share a five-person credit at the film’s end. Granted, these five performers may not yet be household names at the level of the other stars, but it seems kind of tacky to emphasize that they aren’t as famous as the others. The magnificent Olivia Colman, in particular, a Golden Globe winner and widely respected for her work on various British productions, deserves better. The end credits, therefore, come across as a bit of a slap in the face to those five: “An all-star cast… plus five performers you probably don’t know.” The 1974 version’s movie posters contained pretty much all of the actors’ names and faces, regardless of their level of fame. The omission of certain actors from the posters acts as a kind of inferred clue for many viewers, who assume that the lesser-known actors shouldn’t receive the same level of suspicion as the major stars. 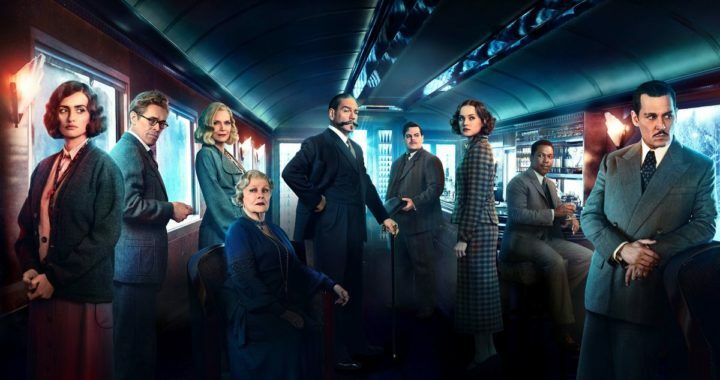 There are a lot of characters in Murder on the Orient Express: sixteen significant roles, all of whom need to receive enough screen time to establish their personalities and to take shape as viable suspects. The 1974 adaptation took two hours and eleven minutes to give each character a proper introduction and a substantial interrogation scene, and mostly managed to make good use of the time. Sidney Lumet managed to give each star a chance to shine—Ingrid Bergman even won a Best Supporting Actress with less than fifteen minutes of screen time, and her questioning scene with Poirot was filmed in an approximately five-minute, single take. In contrast, with a less than ninety-minute run time, the David Suchet adaptation only managed to give, at most, three or four minutes to each suspect, and the results were more mixed in terms of the memorability of the characterizations. Sean Connery famously complained about the unequal division of screen time in the 1974 movie, declaring that Albert Finney was the only star of the film, and that “the rest of us are only glorified extras.” One of the ironies in the movie is that while it’s trying to be a delightful spectacle, it’s not going out of its way to be Oscar bait. More often than not, performances shaped for the purpose of winning golden statues are fake and dreadful, but this version could have benefited from beefing up the roles of some of the supporting cast, particularly the parts played by Dame Judi Dench, Penélope Cruz, and Michelle Pfeiffer. The emotional heft of the film could have been heightened if the movie provided each more screen time in the hopes of giving all three of them a chance at an award, achieved by not just more lines but by more interactions with the other actors. Behind-the-scenes reports of the production indicated that most of the cast got along famously and spent a lot of time together off-set, and it would have helped to have seen more of that interactive chemistry onscreen. One character’s “confession” and attack on Poirot make less sense when one realizes that he couldn’t bring himself to actually kill the detective—it seems more like a scene included for the sake of action—though a gorier location for the discovery of the murder weapon than in the book actually works really well as both a clue and a plot device. I don’t have too much of a problem with the Swedish missionary Greta Ohlsson becoming the Spanish Pilar Estravados (due to Penélope Cruz being cast, and the name is borrowed from Hercule Poirot’s Christmas). There’s a long history of character names being changed in Christie adaptations for all sorts of reasons, whether it’s screenwriter caprice or the fact that a real-life, potentially litigious person has a similar name. For example, And Then There Were None’s General MacArthur became General Mackenzie (among other names in other adaptations) so as not to create confusion with the real-life figure. That sort of change is par for the course, and as a virulent Christie purist, I can accept it. The personality of the missionary has been made more dour and less fluffy, and this revised character is not the same suspect from Hercule Poirot’s Christmas at all. Really, only the name has been used for a largely original character. Comparatively, a lot of little clues that were the invention of the screenwriter take on a clever and insightful meaning in the context of the presentation. The missionary’s aversion to wine is given an added meaning, for example. Linda Arden’s interest in directing takes on a deeper relevance, and the pronunciation of Turin becomes an important clue. Though it’s not spelled out in the film, there’s a subtle clue that the professor of engineering isn’t what he seems, since when doubts are expressed about the structural integrity of the bridge, the professor does not volunteer to examine the bridge to confirm its strength. A couple of critics have argued that the emphasis on racism is pandering to contemporary concerns, but, in fact, xenophobia and ethnic tensions were prominently displayed in the original novel, though Christie used them to subvert expectations in most cases. It is notable how the one character from the original book who was an unapologetic bigot has been reworked for the purposes of the new film. Why do some fans love it and others hate it? From my interactions with people who were displeased with the movie, many feel that it’s not true to the spirit or tone they are used to in Christie works. As one of the fiercest critics of the poorest episodes of Agatha Christie’s Marple series, which at its worst butchered many plotlines, wrecked characters, made nonsensical changes, and filled some plots with fluff, I have no hesitation about savaging adaptations that do a disservice to Christie’s work. But even though Branagh and company brought a different approach to their production, I never got the sense that they treated Christie’s work snidely and superficially, like many TV adaptations that changed the endings without proper clues or explanations, and couldn’t stop sniping at the perceived shortcomings of the era. Branagh, Green, and the rest of the production team wanted to create a film that was both a prestige movie and a mass entertainment. I saw the film as a new creative take on a classic, and not as a cynical, lackadaisical milking of a cash cow. As for me, I was delighted by nearly all of the aspects of the movie, with my main complaint being that the ensemble cast needed more time to work together and display their talents. There’s no pleasing the snobs and poseurs who dismiss Christie out of hand, but I hope that, in the future, other die-hard Christie fans find new additions to the franchise more to their liking. Personally, I’m really looking forward to the announced Death on the Nile.